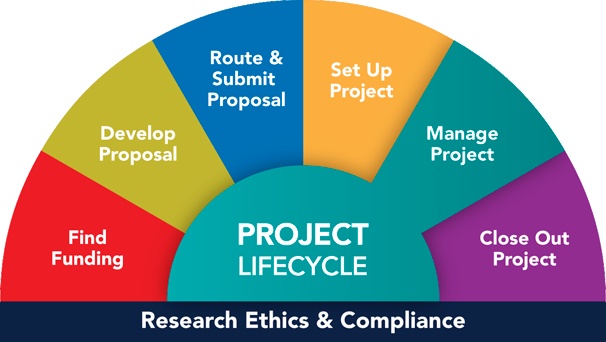 Managing a project successfully is critical to ensure compliance and additional funding. This may involve aspects such as: reporting milestones, steadily spending your budget, monitoring subcontractors, hiring students, or managing the absence of a project team member. Graduate Student Research Assistant (GSRA) Cost Estimates - GSRAs on projects have tuition and salary costs that should be considered. Staff Fringe Benefit Tools and Link - Benefits of staff should be considered on sponsored projects budgets. For all other personnel matters, please see your school or college department administrator for your specific procedures regarding allowable costs. E-Verify - Any employee working on a federal contract must be E-Verified. Extended Leave or Sick Leave - Extended Sick Time Pay (staff and faculty) and Extended Leave (research fellows) are not allowable expenses on sponsored funds, but the U-M Office of Research maintains a central fund to cover these charges. Notification should happen prior to the leave. Friends Account in eResearch - Job Aid on how non-U-M personnel can obtain access to eResearch. Subrecipient Monitoring Guide and Roles & Responsibilities Appendix (Finance) - Refer to this for an overview of departmental and central administration roles and responsibilities during a subaward. To change a department ID on a PAF, please see the Post Award Change Form (above). To change a department ID on a sub-P/G (project grant), contact your Finance-Sponsored Programs Customer Service Coordinator for your Department. Funds Distribution and handles any special billings and the reconciliation of the various federal letters of credit that are used to fund projects. The Finance-Sponsored Programs customer service area is the main contact area for Post Award Administration. Their customer service coordinators are assigned to each of your departments. Sponsored Programs prepares the financial status report (FSR) in accordance with the Uniform Guidance (2 CFR 200) (formerly OMB Circular A-110). The Uniform Guidance guidelines set forth detailed requirements with respect to the complete and timely submission of financial reports and other such closeout procedures for federal grants and contracts. Failure to adhere to these reporting requirements in connection with a specific grant or contract may result in the withholding by the federal agency of new awards campus-wide or the suspension of payments for costs incurred by the University on other projects funded by the agency. What is the balance available on my Project/Grant? Obtaining a Friends Account in eResearch Job Aid on how non-U-M personnel can obtain access to eResearch.